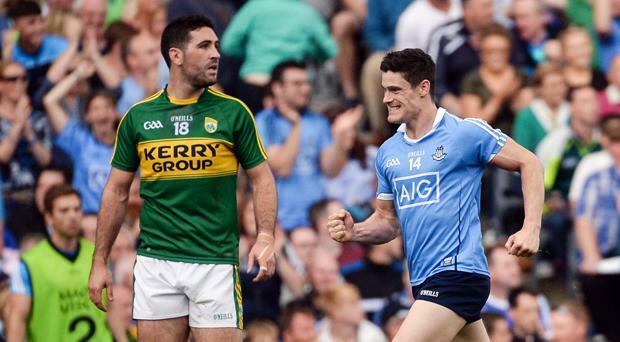 FORMER Kerry captain Bryan Sheehan is the latest high-profile football figure to raise the prospect of Dublin being vulnerable this summer having been sated by last September’s third All-Ireland SFC in succession. On Monday, Mickey Harte speculated on the topic of Dublin’s continued determination to dominate and their ability to replace ageing components with comparable quality. Yesterday, the recently-retired Sheehan – while acknowledging that Dublin remain “the team to beat,” and “favourites to win the All-Ireland” – pondered whether their recent milestone success would erode any of their collective drive undetected. “The three-in-a-row was a big one for them,” said Sheehan, who captained the Kingdom in 2016. “That was the main thing, that was the hunger, that was the focal point to get the three-in-a-row. “Are they going to be as hungry to do the four-in-a-row? “That’s what it comes down to in an All-Ireland semi-final or final, do you have the hunger to do it again? To keep going?” continued Sheehan at yesterday’s Paddy Power Ambassadors launch. “It’s funny,” the St Mary’s Cahirciveen clubman went on, “if you win an All-Ireland, if you win anything you get complacent and is that complacency in there? “Do you train as hard the next year? Do you ease off a small bit on the diet? “Do you ease off on the extra work you do in the gym? On Monday, speaking at the launch of this year’s Ulster SFC, Mickey Harte posed questions of a similar theme. “I think whenever you keep winning and the people have the medals, it is hard to see them all having the hunger to want more,” the legendary Tyrone manager mused. “And sometimes you can’t replace the old hands. “New ones, no matter how talented they may be, they don’t have the experience, the guile of the boys they are replacing,” he added. Sheehan, who suffered big Championship defeats to Dublin in 2011, ’13, ’15 and ’16, reckoned that Jim Gavin’s team would find it “tougher,” this year to hit the same exalted standards. “Connolly not involved (at the moment),” he pointed out. “They’ve had a couple of injuries with Cian O’Sullivan, James McCarthy had a few injuries, Paul Flynn hasn’t seen much football this year with Dublin if at anything all. “So this could be a year now where Dublin, you just have a good sense of where they are now with their team, are they as strong as everyone says? “Is the hunger really there? If they’re to be beaten, this is the year to beat them because this is the year now where I think their guard will be left down a small bit. Sheehan acknowledged, however, that there was a growing nervousness now in Kerry that any further Dublin success could put them on a pedestal with Mick O’Dwyer’s teams of the 1970s and 80s, ‘universally’ accepted as the greatest inter-county football team in the GAA’s history. “They’re going for four-in-a-row,” Sheehan pointed out. “If they do that they’re up with the great Kerry team. “People are always going to be comparing the great Kerry team of the ’80s to the Dublin team at the moment and you’ve got to give credit to Dublin, they’re doing it. “And if they win the four-in-a-row they’re going to be right up there with that Kerry team. “You have to fear them because they’re that good, they’ve won the All-Ireland the last three years in-a-row, they’re going for a fourth,” concluded the five-time All-Ireland SFC winner.